But for anyone who doesn’t know the story, this is just a rock in an Oak Bluffs subdiyision. 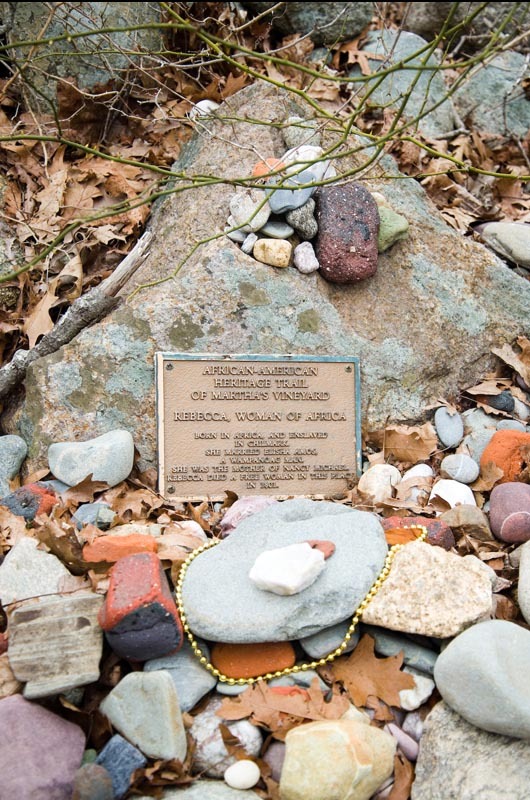 In fact, many sites, though significant to the Vineyard’s African-American history, sit un­marked. Today, some Island people want to change that. Elaine Weintraub, a high school teacher, and Carrie Tankard, vice pres­ident of the Vineyard chapter of the NAACP, have proposed a series of his­toric markers for these sites. They would also like to publish a map high­, lighting the sites and explaining their significance. This African-American cultural history trail, as they call it, would be educational for both Island people and visitors. Mrs. Weintraub and Mrs. Tankard met because of their common interest in this topic. Mrs. Tankard offered guidance and information to Mrs.-Wein­traub, whose extensive research has cul­minated in the book, What the History Books Don’t Tell Us: Aspects of the African-American Experience in Mass­achusetts with Particular Reference to the Island of Martha’s Vineyard. The two began discussing a heritage trail af­ter they heard about one on Nantucket. So far, Mrs. Weintraub and Mrs. Tankard have collected $1,200 to es­tablish the trail. They don’t have a fund-raising goal yet, but Mrs. Tankard said the first order of business will be to publish a map or brochure explain­ing the sites. Then they will pursue fund­ing for markers. Among those attractions is the Chap­paquiddick home of Capt. William A. — Martin, the prominent whaling cap­tain. Captain Martin was just two gen­erations removed from slavery his grandmother, Nancy Michaels, had been enslaved in Tisbury. His great grandmother, known only as Rebecca, was enslaved in Chilmark. Rebecca had been imprisoned and brought from West Africa. The map would also show the inn founded by Charles Shearer. When Mr. Shearer, a former slave, came to the Vineyard with his wife Henrietta, he found a community that had no hotels serving black guests. 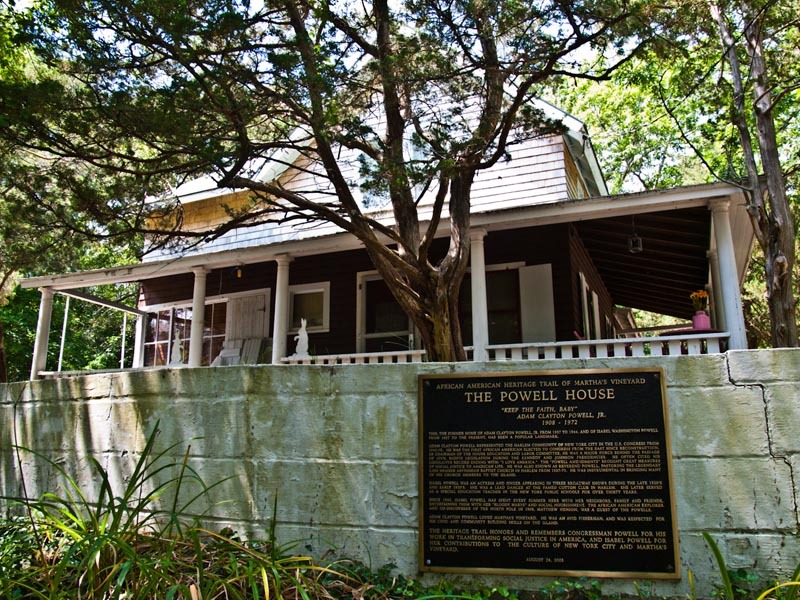 So in 1919, he opened the Shearer Cottage, an inn that would eventually host such notable guests as Adam Clayton Powell Jr. and Martin Luther King Jr. The inn, in the Highlands area of Oak Bluffs, is still open for business today, operated by members of the Shearer family. Many of the landmarks are linked to slavery. The Island, a port for many trade ships in the 1600s and 1700s, was also a temporary stopping point for south-bound ships carrying African prisoners. Some Island families had African slaves, even after Massachu­setts banned slavery in 1788. Mrs. Weintraub would like to show the part of Chilmark, near the Great Pond, where the African woman called Re­becca was a slave. Still, Mrs. Weintraub wants the trail to emphasize people, not just slavery. One aspect of Island history is the re­lationship between Native Americans and African-Americans. The Gay Head Wampanoags were known for provid­ing refuge for African-Americans. Randall Burton, an escaped slave, was one such beneficiary. Mr. Burton, an escaped slave, had stowed away on a boat that traveled from Mississippi to Hart Haven. From there he traveled to Gay Head, where he hid in the cran­berry bogs. The sheriff found Mr. Bur­ton in Gay Head but became transfixed and unable to arrest him, “unable to carry out the work of the devil,” according to the Sept. 29, 1854 edition of the Vineyard Gazette. Mr. Burton sailed to Menemsha, and from there to New Bedford. Eventually, he escaped to Canada. Some historians say the Wampanoags guided Mr. Burton; others say an Island abolitionist group took charge. “It could even have been a combination of both of those,” Mrs. Weintraub said. Whatever happened, the story is important, Mrs. Weintraub said.